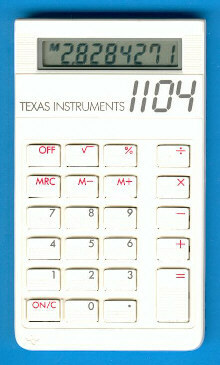 Size: 4.4" x 2.5" x 0.40"
The TI-1104 was introduced in the year 1986 together with TI-1103. Both calculators based on the TI-1100 II. This TI-1104 is an early one manufactured in Taiwan, the electronics inside carries still the TI-1103 name. Later models were assembled in Malaysia. Until 1989 a minimum of 15 stylish colouring schemes appeared. Please click on the picture at the right as a switchboard to all known versions of the TI-1103 and TI-1104 family. Funny to know that Texas Instruments created yet another design of the TI-1104 and introduced it under the Number Beat label. If you prefer the AOS system, view the MathMate. AOS™ is a trademark of Texas Instruments. © Joerg Woerner, May 26, 2004. No reprints without written permission.